An intern has taken the fall for one of the campaign season's earliest facepalm moments in political tweeting. 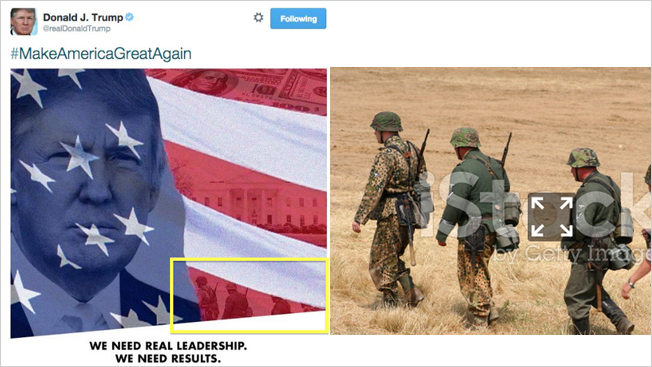 On Tuesday, Donald Trump's Twitter account posted an image featuring his face, the American flag, the White House and … people dressed as Hitler's Waffen-SS soldiers. "We need real leadership," the image stated. "We need results. Let's put the U.S. back into business!" The image was clearly meant to show U.S. soldiers, but instead Trump's team pulled a photo from a World War II re-enactment featuring several men dressed as Nazi soldiers in green camo. History buffs spotted the oddity and sleuthed out the origins of the image. You can read all about how the Twitter investigation played out thanks to this handy recap from Mother Jones, which also tracked down the photographer of the original image.